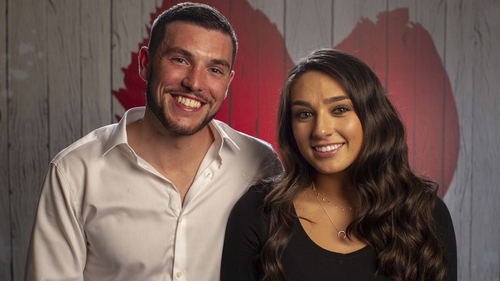 First Dates Ireland couple Aran and Olivia captured hearts around the country with their appearance on Thursday night's episode of the show, and the pair have revealed that their dates are "much more interesting" now. Speaking to RTÉ Entertainment, Aran explained that they didn't become involved straight away after their chemistry-laden first date. "So for the first little bit after the date we both had our own lives, working hard, someone was changing jobs", he said. "There was loads going on", agreed Olivia. "So we didn't really catch up for a few months after the date, but more recently we've been seeing each other a bit more, going on a few more dates. We were saying it would be quite funny if you saw one of our dates now in comparison! ", he said. "They're much more interesting! ", Olivia laughed. "We're just way more relaxed now, our conversation topics are a lot more in depth and less superficial I'd say. So we'd love if somebody recorded one of our dates now, they're much better!" When asked in his post-date interview what the best and worst thing about Olivia is, Aran responded: "Ask me in two months!" He said of the answer: "So I said ask me in two months and then genuinely two months after, I had no idea. We hadn't said anything, I didn't learn anymore, we hadn't been talking. "But now I can say I know a lot more and I can say that my favourite part would probably be your brain. I'm kinda into it, the conversation, how we get along, the stuff we talk about and get in depth with is really good and I really enjoy it." Aran continued that he doesn't have a worst thing as he doesn't "really dwell on the negatives too much"
"In life in general, every time you hold onto a negative it pulls you back a little bit and I want to go forward", he said. "I'm happy to go forward", Olivia responded. "Let's do that then", Aran said. Olivia said the best thing about Aran is his "energy". "It's infectious", she said. "I could be in a terrible mood or something could be getting me down and he just has this inherent ability to make you happy. He passes on all of his good energy and it's just the most amazing thing to be around." "That's really nice, thank you", Aran said. Olivia said the best thing about Aran is his "energy"
She never expected to meet someone like Aran while taking part in the dating series. "You can hope and wish, but I don't think that I expected to be sitting across from somebody that I got on with so well, never mind what happened after the date, the actual date itself was so enjoyable, and there was such good conversation and I just felt relaxed", she said. "I felt relaxed in a way that I would only feel around my closest family and friends, not somebody that I had met two minutes prior while being filmed. I felt really lucky to have had the date that I did." Aran said they're happy to "move forward". Aran said the best thing about Olivia is her "brain"
"Who knows what will happen? ", Olivia added. "We're very much live in the moment kind of people, for this moment now, we're enjoying it, we're having fun. But dating when you're older is different, it's not as cookie cutter or as black and white as it can be, but for the moment I'd say we're happy moving forward." Needless to say viewers were rooting for the pair. Aran and Olivia are the prettiest couple on #FirstDatesIRL, maybe ever. Ok, we need to hear more from Olivia and Aran! Can we have a #FirstDatesIrl catchup! First Dates Ireland airs on RTÉ2 on Thursdays at 9.30pm.